Pakistan says there was a camera in the shoes, nothing can be more absurd than this as she traveled in 2 flights with those shoes on. It is an absurdity beyond measure, the Union minister said. NEW DELHI: External Affairs Minister Sushma Swaraj on Thursday said the meeting between alleged Indian spy Kulbushan Jadhav and his mother and wife lacked "humanity" and "goodwill" accusing Pakistan of conducting it as a "propaganda exercise" and "an opportunity to exploit the situation". 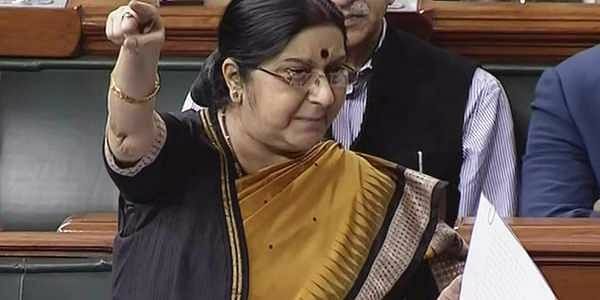 Sushma Swaraj was making a statement in the Rajya Sabha on the December 25 meeting between death row inmate Jadhav and his wife Chetna and mother Avanti. The Minister met Jadhav's wife and mother after they returned from Pakistan and spoke to Avanti again on Thursday morning. Sushma Swaraj condemned the way the Pakistani authorities allowed the meeting at the Foreign Office in Islamabad and asked them to change their clothes and shoes, and remove bangles and even their "mangalsutras". "The first thing that Kulbhushan asked his mother was 'what happened to father' after he saw no mangalsutra on his mother. "The manner in which the meeting was organised was appalling. Their clothes, shoes, bangles and even their mangalsutras were taken away. Their human rights were violated again and again, and an environment of fear was created for them," Sushma Swaraj said, a day after Opposition members expressed outrage over the treatment meted out to Jadhav's family. The Minister said the meeting between a mother and her son, a wife and her husband "after going through so much was turned into an exercise of propaganda and an opportunity to exploit the situation. "The family wished to meet Jadhav and we arranged for it. Even Pakistan agreed for it this month (December). This could have been a step forward for both countries, but this wasn't to be." She said it was absurd on behalf of Pakistan to suggest there was a mystery chip or camera or recording device planted inside Kulbhushan's wife's shoes. "It is an absurdity beyond measure." Leader of Opposition and senior Congress leader while echoing the Union Minister's statements said, "Misbehaviour of Pakistan with wife and mother of Kulbhushan Jadhav was misbehaviour with all Indians. Regardless of political differences, when it comes to nation's dignity & another country misbehaves with our mothers and sisters, it will not be tolerated." While addressing the Lok Sabha Sushma Swaraj said, "Thank God they didn't say that there was a bomb in her (Kulbhushan Jadhav's wife) shoes! If for security reasons she was made to take off shoes, they should have returned them when she was leaving but no, they had to commit some sort of cruelty." She added," The meeting was started in absence of the Deputy High Commissioner, if he would have seen how clothes of the family members were changed, he would have registered protest there and then. It was specifically agreed upon by both sides that media will not be allowed to come close to the family but Pakistani press not only came close to them but also harassed them & hurled taunts at them." Earlier on Wednesday, the Parliament witnessed protests, with various political parties, including the Shiv Sena, Trinamool Congress and AIADMK condemning the way Pakistan humiliated the kin of jailed Indian national Kulbhushan Jadhav in Islamabad. The wife and the mother of Jadhav were asked to remove mangalsutra, bangles and bindi, besides having been asked to change the attire, for "security" reasons. After the meeting, Jadhav's mother and wife were also harassed in heavily guarded foreign ministry office by Pakistani journalists. Adding to these treatment, Pakistani journalists heckled and harassed Jadhav's mother and wife by hurling insensitive questions on them — "Aapke patidev ne hazaron begunah Pakistaniyo ke khoon se Holi kheli ispar kya kahengi? (your husband killed thousands of innocent Pakistanis, what do you have to say about that?)'" and "Aapke kya jazbaat hain apne kaatil bete se milne ke baad? (How do you feel after meeting your killer son?)". Jadhav is on a death row in Pakistan over charges of terrorism and spying for India's intelligence agency- Research and Analysis Wing (RAW). On May 18, 2017, the International Court of Justice stayed the hanging after India approached it against the death sentence.